It's a wonderful weekend here with sunshine and warm weather I'm sharing some beautiful roses I received as part of my Valentine gift. Tea is served and I have some sweet verses from my Valentine Card to share with you. Today, I know for sure that when our paths came together and we found one another, it was really only the beginning of the most beautiful journey of all... the journey of two hearts that beat as one. The most beautiful roses with a hint of pink on the edges. I love to have a mosaic in my collection. Bless you all for joining me today and during this week. I do have some garden photos to share with you, but my income tax preparation is taking precedence over blogging. I know everyone understands what I'm taking about. Beautiful verse, tea set and roses - does it get any better? The tea set and the flowers are both so beautiful. You're a lucky woman. So beautiful Betty. Your love story is such a blessing. I absolutely love your pretty tea china! This post is so lusciously beautiful. Pink, my favorite color. Rose, my favorite flower. Tea cups, another favorite. I am in heaven at the moment. Hello Betty, your roses are gorgeous! I am happy for you and your love.. Beautiful post and images. Have a happy new week! Those roses are stunning! And the poem is lovely. Having just recently reached out 49th anniversary I read it and applied it to my own life and marriage. Thanks for posting it! What a sweet love story! 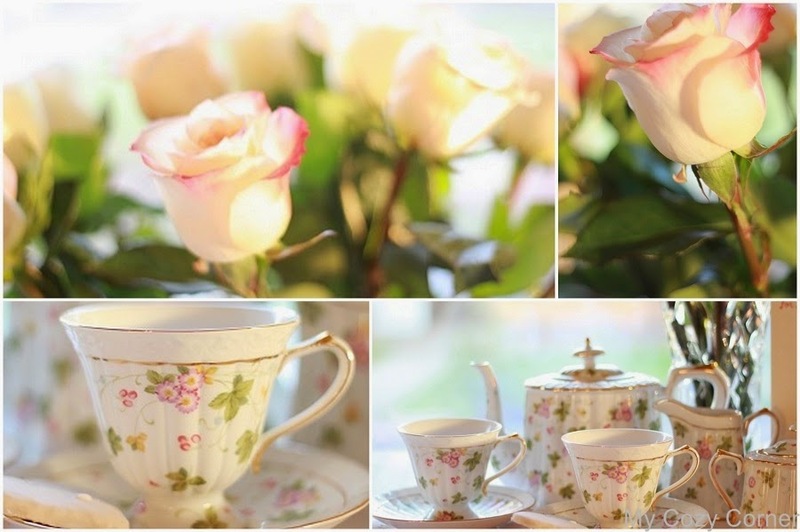 Your roses and Winrose collection tea set are lovely! Gorgeous teaset...I can see why it's a favorite! And what a wonderful card! Your roses are lovely too. Thanks so much for linking to Tuesday Cuppa Tea! Betty, your Winrose teaset is just gorgeous! Beautiful love story -- complete with roses! Happy Tea Day! This is such a beautiful post, Betty. Your roses are dreamy and the china is just so pretty! Your journey together has truly been a life long romance and it doesn't get any better than that. Thank you for sharing and joining me for tea. Your flowers and china mesh together perfectly. So pretty! What stunning photos and mosaics! Teacups and roses just go together like bread and butter. These pink-tipped roses are always some of my favorites! Your Roses and China are both so pretty. Pink, Teacups and Roses...some of my favorite things! Wow. What a beautiful post. Your tea set simply took my breath away. Just stunning.